Home Facts Are Praying Mantis Dangerous to Humans? Are Praying Mantis Dangerous to Humans? No, not at all! Praying mantis are absolutely harmless to humans although they can have a nasty bite if provoked. As a matter of fact, mantises make pretty popular pets. 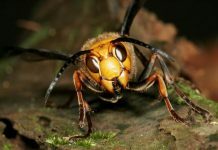 They are the most famous pets of the insect world. 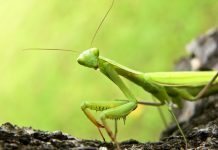 In some countries, mantises are revered particularly for their praying posture. People of the southern Africa likely give mantises the status of god. 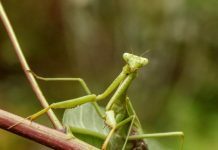 Praying mantis can be deadly for grasshoppers, crickets, spiders, or even hummingbirds but they don’t pose any threat to humans. Mantises can bite you that can cause a just a little pain. They mostly bite when you mishandle them else mantis do not look at humans as a potential threat. 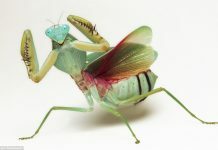 You can raise mantis in captivity but you’ve to breed them since mantises hardly live more than a year. Many people around the world breed mantis in captivity. Is a Praying Mantis Poisonous? Despite their somewhat intimidating appearance, these arachnids aren’t really venomous. Despite their somewhat intimidating appearance, these arachnids aren’t really venomous. Praying mantis are closely related to cockroaches. 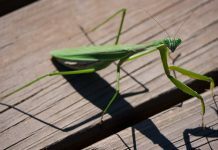 People typically think of a mantis as dangerous because of mantis’ eating habits and predatory behavior it demonstrates against few arthropods. 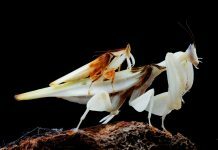 For instance, the female mantis eats her mating partner after copulation. The unusual behavior such as this isn’t really observed in other insects.